THE END OF THE UNIVERSE IS ONLY A HOP, SKIP, AND SLIGHT STUMBLE-THROUGH-A-WORMHOLE AWAY Harry Priest just wants to make sure his ex-wife doesn’t take away his visitation rights, and his dead-end job cleaning up crime scenes for the past ten years isn’t doing him any favors. But when Harry attends what he thinks is a routine death, he stumbles onto a secret multiverse of alternate realities all reachable through universe-hopping gates. Policing these worlds is Havelock Graves, the Interstitial Crime Department’s top agent for ten years running (according to him). 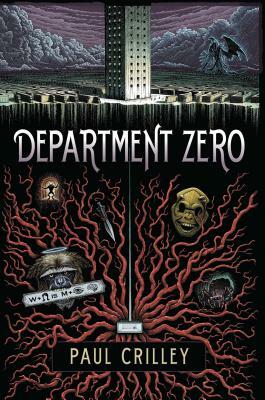 When Harry accidentally messes with the ICD crime scene, Graves and his team are demoted as low as they can go: Department Zero. They’re recruiting Harry too—not because he charmed them, but because he just might hold the key to saving the universe . . . and getting their old jobs back. To do this, Graves and his team set out to solve the crime that lost them their jobs. A crime that involves a cult planning to hunt down and steal the fabled Spear of Destiny in order to free the Great Old One Cthulhu from his endless sleep in the Dreamlands. (Because that’s another thing Harry soon finds out. Everything H. P. Lovecraft wrote is true. Like, everything.) The team will have to fight its way through realities filled with Martian technology and evade mad priests (Harry’s favorite kind) in a realm of floating landmasses where magic really exists. And Harry has to do it all in time to say good night to his daughter.